SIERRA has excellent experience in successfully building and implementing large applications using the Thick Client based Client/Server architecture with relational database management systems (RDBMS). The technologies used for building such applications include Microsoft Visual Basic, Microsoft Visual Basic.Net, PowerBuilder and RDBMS software like Oracle, MSSQL, Sybase, DB2/400, MySQL etc. 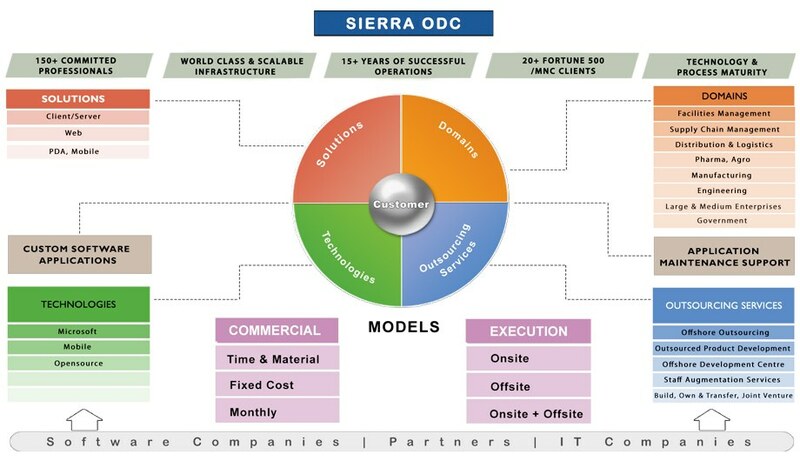 SIERRA has built several enterprise level products and projects that are called Server based or Thin Client based or Web based or Browser based applications with relational database management systems (RDBMS). The technologies used for building such applications include Microsoft ASP.NET, PHP, JSP etc and RDBMS software like Oracle, MSSQL, Sybase, DB2/400, MySQL etc. SIERRA has great expertise in building mobility software solutions that are PDA based and Mobile based applications that work seamlessly with the Client / Server or Web Applications or even independently. Microsoft Pocket PC, Windows CE and Symbian are some of the platforms and SIERRA has built several applications using Microsoft eMbedded Visual Basic (eVB), Microsoft Visual Basic .NET and .NET Compact Framework.